And now time for a brief hiatus! See you guys in two months! … Just kidding. See you all on Friday! Thanks for the comments! LEAVE MORE. Oh man, your comments lately have really been making my nights awesome. I know we promised not to outright ask for them for a while but I am not responsible for Victor’s actions. I’m sure you can all predict what’s happening here, and OH BOY I AM EXCITED. “Sammichy” is now officially the best word ever. You can thank Victor for that one. 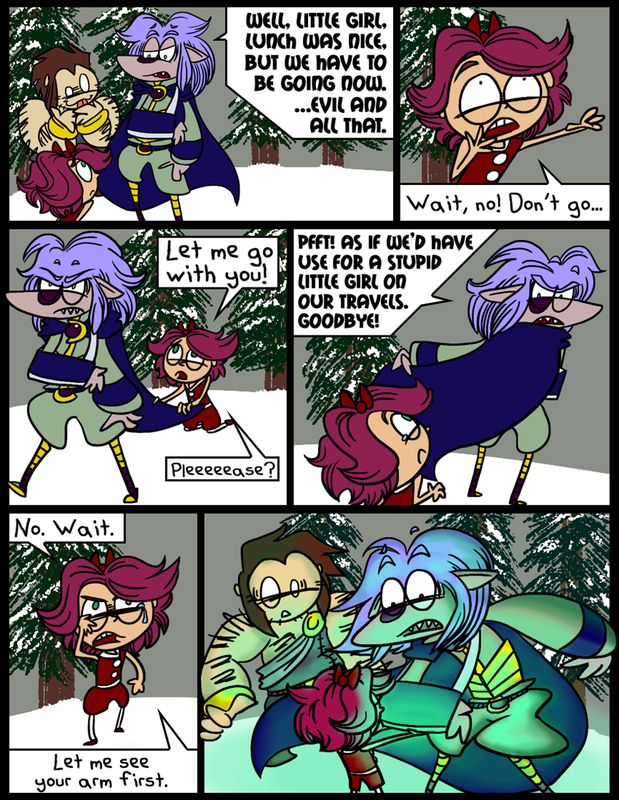 Skarva’s looking pretty Magus-y in that fourth panel! Assuming this is going the way I think it’s going, the girl is going to give a display of magic greater than any we’ve seen from Mr. Dark Lord. Hey. Hey. That bush thing. It was pretty cool. That fake hiatus notice was just mean. PS… what got him so mad? Yeah, Skärva’s all about destruction and trickery. Healing? THAT’S SO GIRLY. At least that’s how he justified not being able to do it. The truth is, it’s an extremely rare ability and you can’t just learn it. Well, his arm is broken, they’re behind schedule, and while the lunch was good, a little girl had to get it for them. He would have liked to move on from that without the symbol of his shame following him around. Also he’s Lord Skärva and he just doesn’t know how to be nice or grateful. You’ll see that in the coming comics no matter what this little girl does for him. PPS will there ever be a “Boss” on here? Yes, but this isn’t that game, is it? Yes. His name is Lord Tiberius Skärva IV. Spoiler alert: he is the final boss. God, that was a horrible pun. …I appreciated it. See, the reason why Victor is the official writer is because if I was, pretty much all the comics would end with a pun like that, while all the characters force a pained grin. Hehe, I don’t think you’ll find any info on Skärva just floating around out there on the internet; most of it is still in my and Victor’s heads. Anyway, Skärva is definitely not a god, but his name is a real Swedish word. It means “shard.” Something that is sharp, pointy, broken, dangerous, something that most people avoid. What’s that book? I can tell you what the title means. Cool. So the girl can heal people. On a related note, I smell Derk and little girl shenanigans on the way! ShhHHHHHH maybe not, maybe she can magically give people tattoos. Skärva would look good with a pack of sharks swimming up his skinny little arm, don’t you think? He might even stop wearing those ridiculous poofy sleeves. Anyway, I’m not surprised you can smell it because it gets pretty strong in the future and it smells like bacon and flowers and cotton candy. ……..It’s kind of sickening. it wont change the picnic supplies of doom will it?? Nah, in fact they will probably have more picnics with her around. They’ll just have to pack a little extra, but only a very little. I may have to make fanart of these characters one day. =V Only two other webcomics of the many I like have gotten that far. I just find these characters so…. worthy of fawning over. XP Pardon my fangirling. cant remember the name of the book,ill check..I think it was some swedish bible,not so cool really,seemed kinda all snow and no substance…yeah it’s getting harder to write these bad puns…..iced just remebered,my cousins might start showing…inferno might…yeah we all have element themed personas online….I suggest you give the hot head a could shoulder…. I always wonder, if those red potions come in bottles, even if they do taste like metal, why you can’t just hold on to a few.